For those of us who swoon over the pleasures of swimming, the only thing better than experiencing the water’s rejuvenating power is an outdoor pool, replete with fresh air and sunshine, that has been jazzed up with amenities to deliberately pump up the joy. 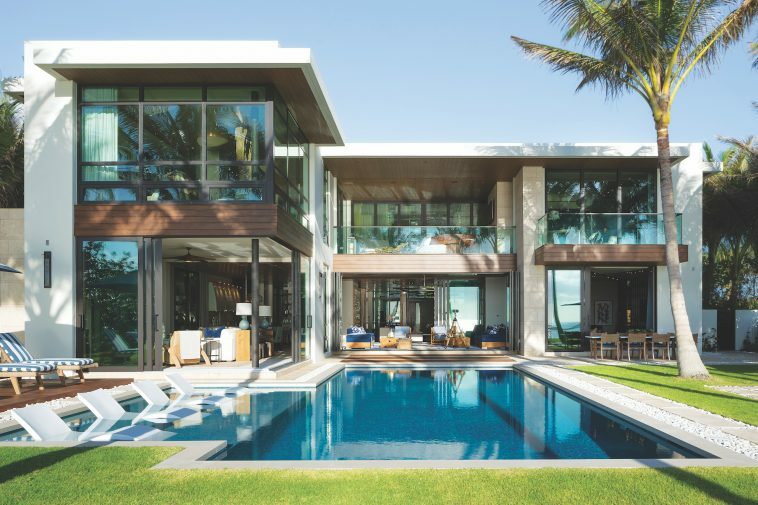 Outdoor living areas anchored by a swimming pool are being elevated to new heights today by award-winning professional designers and product innovators. New techniques allow the pools themselves, and the areas around them, to be more personalized and more fun than ever. The owner of an oceanside home in Malibu, California, approached Frank Vitori, co-owner of AquaBlu Mosaics, with a request: renovate the home’s large pool and spa in an aquarium theme. The renovation, finished this spring, features an exquisitely detailed scene of sea creatures such as whales and octopi along with the whimsical touch of mermaids. All the sea life and fantasy images are expressed in easy-on-the-eyes coastal colors for a powerful organic effect. This artful endeavor started with a high-tech method. Working with the homeowner and a graphic artist, AquaBlu technicians created a panoramic scene printed on one-inch-square glass tiles sourced in Spain. “We can create any design indoors or outdoors,” Vitori says. “If the customer can dream it, we can create it, in glass or porcelain tile.” Any image the client chooses, even a five-by-seven photo, can be turned into a wall-size glass mosaic. Another client was inspired by a pattern she saw in a chapel in Denmark; AquaBlu reproduced it via glass tiles encapsulated with 24-carat gold for a light-catching sparkle and glow. Although AquaBlu works mostly in pool design, the family-owned company also creates mosaic walls, backsplashes, and other features for home and commercial interiors. Tom Casey’s knowledge of swimming pools is long and deep. As vice president of sales for Anthony & Sylvan pool designers and builders, Casey estimates the company has built 380,000 pools since its start 72 years ago. “Pools are becoming areas of entertainment and relaxation beyond just swimming and exercising,” he says. Continuing their breakout from summer-only entertainment, swimming pools are evolving in new ways, as Casey says, “to extend the season past traditional summertime.” One cool way to add major spark is with fire elements. Casey sets the stage: two or three fire bowls, set in copper pots on pedestals, perhaps with a stream of water filling each bowl and spilling over into the pool. The overall effect is a stunning statement in fire and water. “From an aesthetic perspective, they are really captivating,” he says. Lighting for pools—LED is a matter of course these days—is changing dramatically. Consider creating a light show in your pool, and switching palettes as you like, Casey advises. Imagine the effect of a red, white, and blue preprogrammed light show for July Fourth, or shifting shades of blue, purple, and green for Mardi Gras, all auto-changeable with a smartphone. “I love creating beautiful environments,” Anderson says. “Pools have a lot of room to become aesthetically pleasing places that carefully consider the environment.” A variety of techniques can create a luxe pool area that is cohesive with the surroundings and respectful of nature. Anderson’s sumptuous description of kitted-up pools is addictive. As the trend in larger tanning ledges continues, Anderson’s company is offering products that allow for fully designed spaces, including an in-water sectional sofa, dining table, and chairs. “One of the hottest items is the daybed,” he says, which can be enhanced by adding a side table or umbrella. Ledge Loungers’ go-to product is the in-water chaise lounge and shade. “It’s a full experience,” he says. The company’s designs are durable as well, with in-pool products constructed of low-density polyethylene, the same material used in commercial water slides. Naturally, many homeowners, especially those with children, measure the success of their pool areas in terms of how much healthful, fun activity they inspire. Jeffrey Ingrassia, owner and president of FX Design Team on Long Island, New York—which includes Outdoor Living FX, Aqua FX, and Theming FX—says clients at every income level are looking to make their backyards active places. “Everyone’s into fitness,” he says. 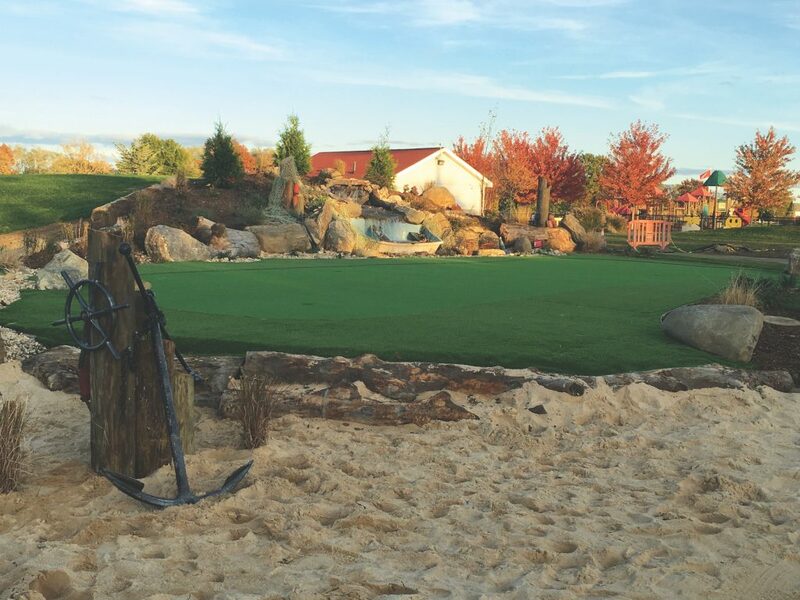 Ingrassia’s own home on Long Island, New York, has a multipurpose game court and putting green next to the swimming pool, complete with a cave structure, waterfall, and slide. His daughters grew up playing on the court, and the girls’ teenage friends flocked there to socialize. “We always knew where the kids were,” Ingrassia says. He recommends a rectangular court with an adjustable net, where family and friends can dive into badminton, volleyball, roller hockey, or hoops, and then jump in the pool. “It makes it so functional,” he says. “Your place will be where teenagers want to hang out.” His family’s court is 30 feet by 55 feet with a green interior, purple outlines, and built-in lines. He especially likes the polypropylene surface, which is hard but also has some flex.